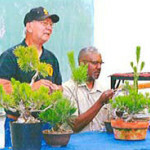 The June meeting featured another San Diego bonsai expert, Fred Miyahara. He gave a presentation on black pine care. Fred brought Michael Sykes back with him. Michael demonstrated Fred’s candle pruning method as Fred explained.